The Continuum Frame can be configured in multiple set-ups and optional accessories, so it will be the perfect fit for you no matter what your quilting requires. Think you might upgrade your machine to a longarm in the future? The Continuum frame can work with your short or midarm machine now, and then be adjusted for a longarm when you need it. Add the optional accessories now or later to make your quilting process more convenient. 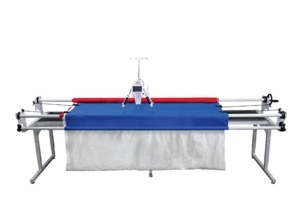 The new Continuum Quilting Frame has been designed by the Grace Company to perfectly accommodate the Q'nique 21 machine, as well as a number of other machines on the market today. The Continuum machine quilting frame is a modular frame with many accessories to configure it to meet your quilting needs. The Continuum has been designed to perfectly accommodate the Q'nique machines, as well as a number of other machines on the market today. Note: If ordering the Continuum frame for use with a machine other than a Q'nique machine, please call in to Grace Company so we can make sure you receive the correct parts for your machine. THE Brother Dream Frame Pro: Securing Your Stitches. THE Brother Dream Frame Pro: Assembling Your Quilt Sandwich.